1/3 cup miso paste (I buy mine from Urban Hippie in Nelson). *Update, you can now buy this at Farro Fresh in Grey Lynn. Place miso paste, fish sauce & water in a saucepan over medium-high heat. Cover & bring to a boil, add chicken, asparagus & beans & stir. Lower heat & simmer for 5 minutes or until chicken is tender & cooked. 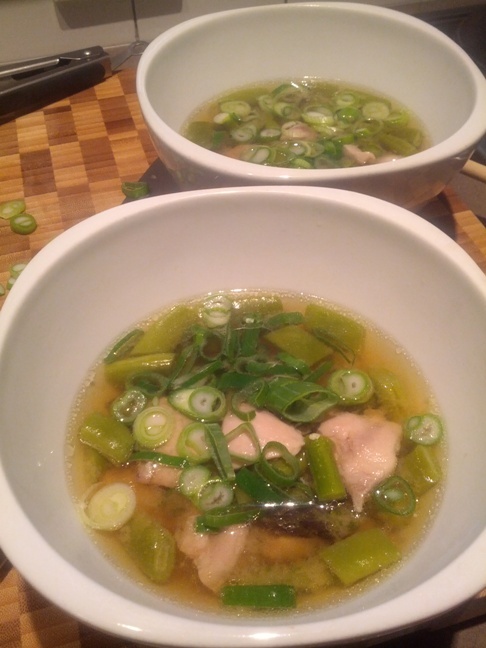 Ladle into soup bowls & sprinkle with spring onions. Enjoy!